I’ve been making music, professionally, longer than I’ve been writing–for sixty-one years in fact, so I think I’ll just jump right into this post (the way I might a tune once its been called for at a gig) and show you and tell you about the three CDs I’ve recorded so far–although all of these came about when I’d been writing for some time and hoped to match my own words with my own music as best I could. 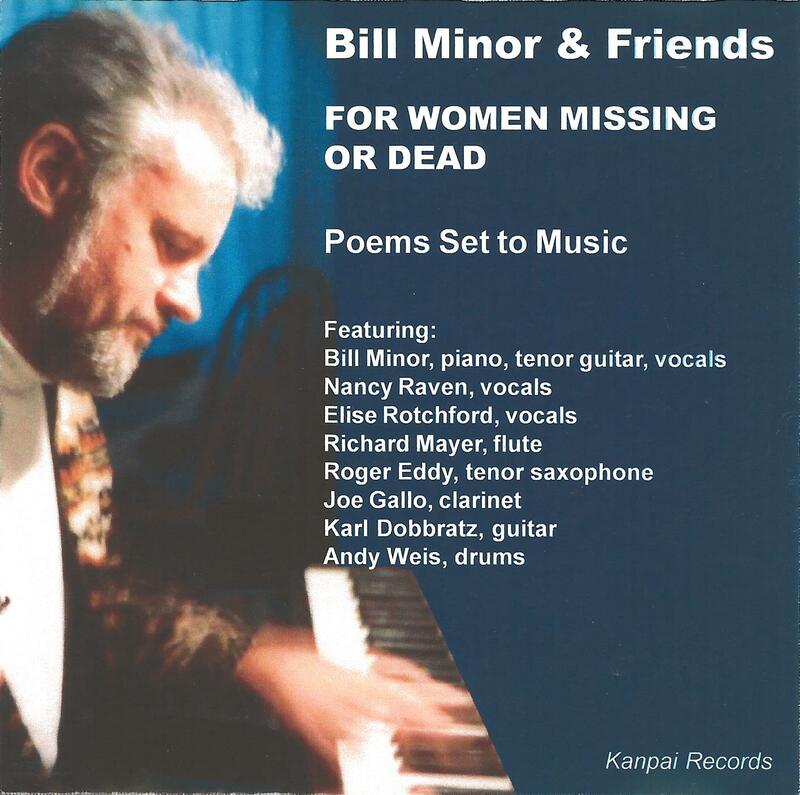 After I published the book For Women Missing or Dead, I recognized that this cycle of short, lyric pieces (fifty-six poems in all) were well suited for a musical setting (they felt a bit like late night “blues” pieces), but it took me twenty-three years to get around to writing that music. I didn’t want merely to provide a musical ambiance behind the words, but compose O-honest-to-God songs (a la George Gershwin and Cole Porter–to suggest some good company)–and after I’d done so with about twenty-one of the poems, I selected fourteen I wished to record, and then did so. In June, 2005, my good friend, poet Robert Sward, brought J.J. Webb to the house. J.J. was a former head of web development at Stanford University Business School, and a poet with a long history of internet editing. He had recently set up, on a site he called Beau Blue Presents, an internet broadside: Robert’s own “My Rosy Cross Father,” poems that included Mp3 sound (Robert reading), text, and graphics. J.J. asked if I would be willing to contribute eight poems for his next Beau Blue Presents venture and, because I also play piano and had composed a bit, he requested original music to accompany the spoken word presentations. I was also originally trained as a visual artist, so J.J., an artist himself, immediately went to work, going about the house and through my studio, gathering pieces of mine he felt would provide further “accompaniment,” or suitable counterpart, to the poems. When my portion was posted on Beau Blue Presents, it was called Bill Minor’s Mortality Suite: A Broadside of Jazz Riffs: http://jjwebb.ihwy.com/mortalitysuite. Later, J.J. Webb would branch out into Flash Animation for another series called Blue’s Cruzio Cafe, and I contributed a poem, “Dreaming Sandra Bullock,” accompanied by a “cartoon” of me reciting the poem (something both fascinating and a bit scary, like watching yourself on old 8 mm films). This series has gone on to prove quite popular, cited by The Philadelphia Inquirer as one of the most innovative approaches to poetry online: http://members.cruzio.com/~cafe/greenroom.html. 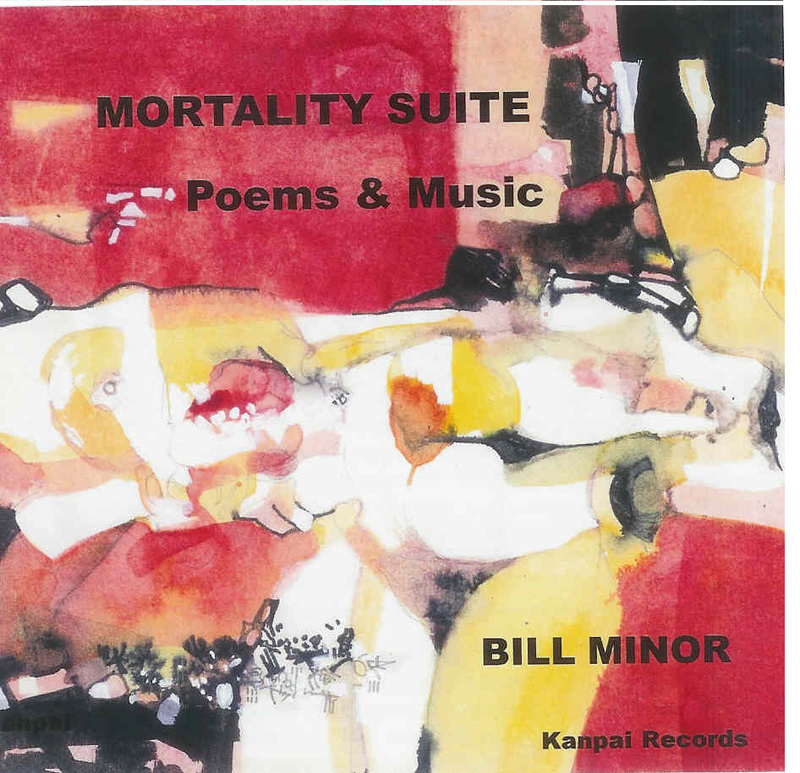 After Bill Minor’s Mortality Suite appeared on J.J.’s site, I dreamed of adding to that material and presenting it as a spoken word CD (with music), and thanks to another good friend, bassist Heath Proskin (who joined me on four additional “numbers,” and also helped mix and master the CD), recording engineer Steve Mortensen, and Karl Dobbratz at Good Brother Sound, that dream came true. Once again I enjoyed the first-rate assistance of vocalists Nancy Raven and Elise Rotchford, instrumentalists Richard Mayer (flute), Karl Dobbratz (guitar), and Andy Weis (drums). And once again, Roger Eddy was responsible for recording three of the tracks. And once again, copies of this CD are available if you contact me: bminor@redshift.com. This CD came about while I was working on The Inherited Heart: An American Memoir. While doing research on my father’s family, which goes back to 17th Century Middlesex County, Virginia, I discovered Charles Minor Blackford, my great-grandfather’s first cousin’s son, and his remarkable wife Susan. They carried on an extraordinary correspondence throughout the Civil War. I wrote three chapters on them for the memoir and then, having made two trips to the University of Virginia Special Collections Library in Charlottesville to do further research, I made the acquaintance of Gregory Starbuck, Executive Director of the Historic Sandusky Foundation in Lynchburg. 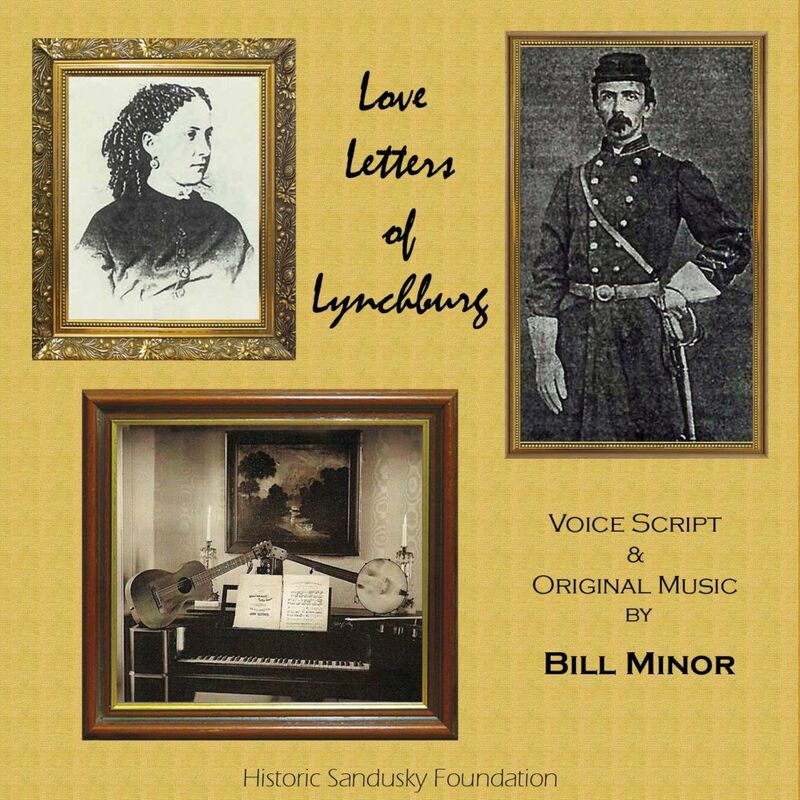 Greg was completing a compilation CD called Lynchburg Melodies: History of the Hill City in Song, and when I gave him a copy of my own CD Mortality Suite, and we discussed Charles and Susan (he even took me on a tour of their former home in Lynchburg), he suggested I prepare a script based on their letters, the exchange to be read by two actors-and that I also compose an original score of music to accompany the readings. The possibility of undertaking such a project as a commissioned piece was exciting, and I immediately started to work on the score, having asked two excellent musicians I’d been working with in California, bassist Heath Proskin, and flutist Richard Mayer, if they would be willing to participate in a recording project. I also approached two fine local actors: Taelen Thomas, whom I’d seen in splendid one man shows as everyone from John Steinbeck, Mark Twain, Jack London, Daniel Boone and Teddy Roosevelt to Leonardo da Vinci (I knew he’d be just right for Charles Minor Blackford), and Kathryn Petruccelli, whom I’d seen perform as Una Jeffers, wife of poet Robinson Jeffers. With her spirited, spunky nature, her wit and intelligence and compassion, I knew she would become Susan-and she did. Everyone agreed to contribute their considerable skills to the project. I completed the music, and once again we recorded the CD at Roger Eddy’s studio. And as he has so often done, my son Steve (who designed and set up my website: www.bminor.org) came through with a handsome design for the cover. with the Charles Scribner’s Sons (1947) abridged edition Letters from Lee s Army … We have presented four live performances of this work in the Monterey Bay Area, with Taelen Thomas as Charles Minor Blackford, Kitty Petruccelli and Marlie Avant as Susan, and instrumentalists Heath Proskin (bass), Richard Mayer and Kenny Stahl (flute), and myself on piano. At the recent “Book Launch” events for The Inherited Heart: An American Memoir, vocalist Jaqui Hope, who is also a fine actor, plays Susan to my Charles Minor Blackford. The CD is available at: http://www.historicsandusky.org./shop.htm. In a previous post (“Bill Has a New Book Out!”), I also mentioned that a major breakthrough for me with regard to the Brave New World of digital promotion came when I began to post some of my music on YouTube–that in that area I had become a True Believer. I’d like to offer four of those efforts here: the first with a group I had called The Something Cool Trio (Heath Proskin, bass; Jenn Schaaf, drums, me on piano) playing “Ain’t Misbehavin'” at a venue called The Alternative Café; the second Richard Mayer and I playing “Lover Man” for a Wave Street Studios televised tribute to Kalisa Moore, “The Queen of Cannery Row” and proprietor of La Ida Café; the third a video of Jaqui Hope singing “You Go to My Head” (I’m providing piano accompaniment) at an opening at The Pacific Grove Art Center in Pacific Grove, California, and the last offers me reading a prose poem, “Q-Tips,” with Heath Proskin and Richard Mayer at a MHCAN (Mental Health Client Action Network) benefit in Santa Cruz. 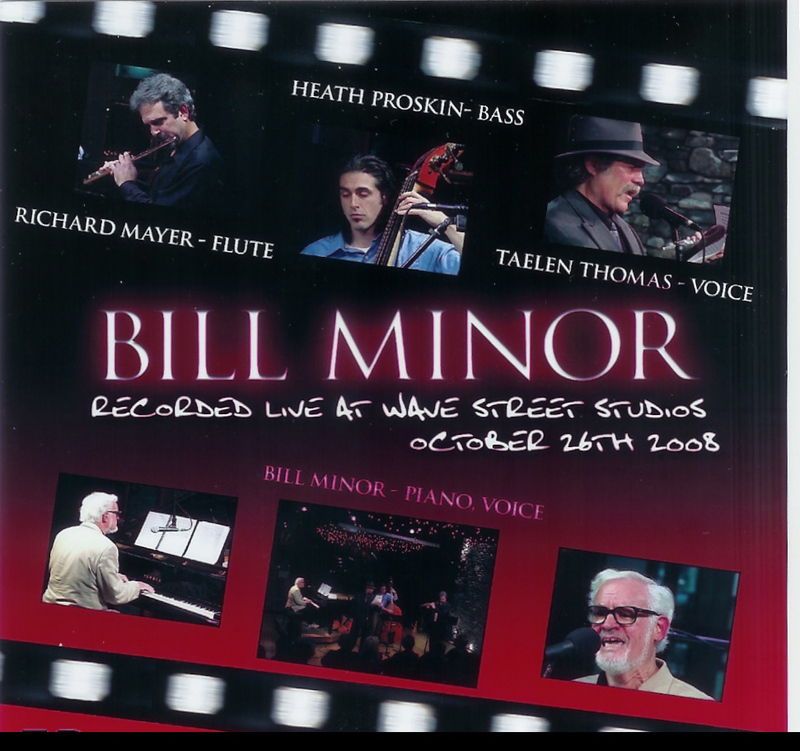 I’ll close out this post with another project I worked on for the Monterey Jazz Festival, and a DVD made when we presented a program at Wave Street Studios that combined work from a book, Trek: Lips, Sunny, Pecker and Me (with passages set to original music) and the Mortality Suite CD. 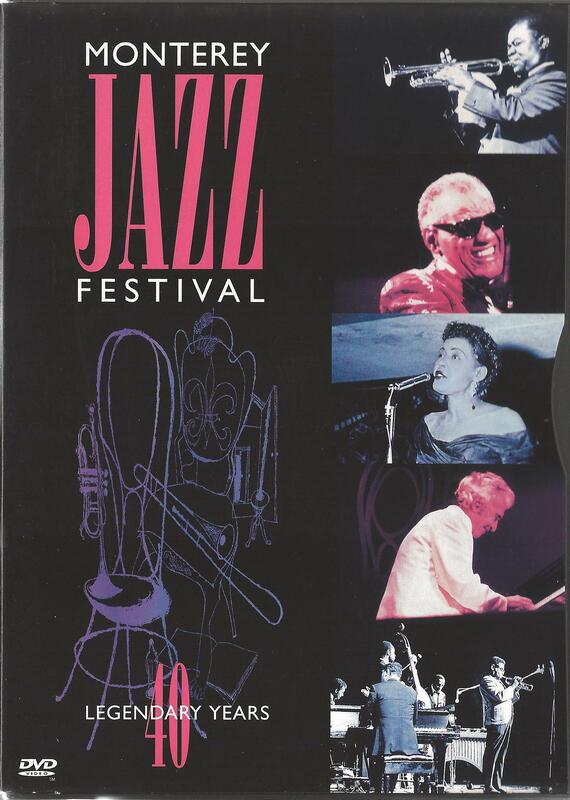 Although Scott Yanow, in his book Jazz on Film, wrote, with regard to this documentary that “came out at the time of the Monterey Jazz Festival’s 40th birthday,” that the “narrative, written by Bill Minor, is excellent and sums up the festival well,” he added that “one does get frustrated at the lack of music”–and a number of people who purchased the DVD (I think the VHS, which came out first, did OK) were not just frustrated but pissed off, led astray by photos of Louis Armstrong, Ray Charles, Billie Holiday, Dave Brubeck, and Miles Davis on the cover and thinking they would see and hear sumptuous live performances by each, which wasn’t the case. Josh Redman and Patrice Rushen were hosts for what was intended to be a sort of “grass roots” documentary on how the festival got started, its founders (Jimmy Lyons and Ralph Gleason), its “mom and pop store” origin, the stage hands and behind-the-scenes folks who gave of themselves–and still give–for its continuance, the jazz education program (I’m still proud of this section), etc.–and there is music provided by Toshiko Akiyoshi, Etta James, and Gerald Wilson–although it remains, as Yanow pointed out, “secondary to the talking,” However, for my money, the tales stage manager Paul Vieregge had to tell about Miles and Monk are worth the price of admission. I enjoyed working on the film (initially I just provided bios for the performers to be interviewed, but after the latter was done, I was given a book of transcriptions as thick as the Bible, Old and New Testaments, and told to “make a story out of it all,” which I tried to do. It was a treat to work with Director Willy Harper–and Clint Eastwood was Executive Producer of the film. I have a chapter called “Uncles” in The Inherited Heart: An American Memoir that tells some of the story of the “totally musical family” I grew up in, but we’ve had quite a bit of music here already, so I’ll save that story for another post.